If there ever was a time for the Wild to patch its game together and show its “resiliency” (sorry, Dan Myers), it’s a three-game homestand that starts tonight at Xcel Energy Center against the San Jose Sharks. I wasn’t in Winnipeg and yesterday was a day off, so today was our first opportunity to chat with the Wild coach since he ended his postgame press scrum two questions in after the now notorious “resiliency” question. Here’s the deal with the beloved coach: He typically tells it like it is, and he usually isn’t in the mood after losses to sugarcoat things and talk about the team’s heart or resiliency by not completing a comeback. So, when he snapped Sunday night that “You’re making it sound like we’re good,” Boudreau, probably intelligently, ended things right then and there. It’s why he also chose not to answer Kevin Gorg’s question first. Now’s the time for the Wild to figure this thing out, which columnist Chip Scoggins wrote about today. The Wild’s 2-8 this month, has lost seven of eight games since beating the Sharks, 3-1, at home March 5 in a suffocating defensive performance to snap the Sharks’ eight-game point streak at the time. Since that game, the Wild has faced multiple-goal deficits in seven of eight games, including five straight, has trailed at some point in eight straight games and has led for 15 minutes, 41 seconds in 480 minutes since. The loss to the Wild triggered a bit of a funk for San Jose, which is 4-4 since including a shutout defeat last night in Dallas, so you know the Sharks will be surly. The Wild’s 8-1-1 in its past 10 at home against last season’s Western Conference Stanley Cup finalist. Boudreau said this is an important homestand. “We get a chance to practice tomorrow, which is great. 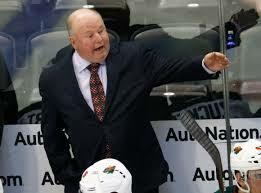 I think it’ll be our second practice this month, which is going to be really important,” Boudreau said. Tomorrow will actually be the Wild’s fifth full practice this month (excluding injured and sick guys missing practice, of course). Boudreau said every game it’s another part of the Wild’s game that’s an issue, so, “once we plug all these leaks, I think when we do start getting successful again we’ll be a much better team rolling into April. I wrote a story on Devan Dubnyk today. Boudreau said the reason he started him a second of a back-to-back in Winnipeg (remember, the Wild didn’t play to play Dubnyk back-to-backs in the second half because of its cushion) and also never pulled him was so he can play his way out of this funk. “Every team needs their goalie. Not just our team,” Boudreau said. “He’s been great for us all year. Like the rest of the team right now, he’s been going through a little bit of a dry spell. But I’m completely confident that he’s going to bounce back. Today was the first chance I got to talk to Jason Pominville since being scratched in Winnipeg. I’ll write about that in tomorrow’s paper, but he said Boudreau told him that he wanted him to rest last game, yesterday and today, meaning he wasn’t supposed to play tonight either. But Ryan White’s sick, so it looks like Pominville will play. Pominville said he doesn’t feel tired, admits he hasn’t been that great since coming back from the mumps (remember he had 24 points in 22 games leading into the bye) and said he’s really “unsure about the message” from Boudreau. I feel I’ve gotten to understand how Boudreau thinks by now, and I think the lack of energy he talks about specifically has to do with the poor line changes in Washington and that ghastly, tired-looking turnover in Raleigh that nearly made Boudreau blow a gasket. He played him against the Rangers, but on a second of a back-to-back in Winnipeg, I think Boudreau felt it would be a good chance to get some fresh legs in there for a veteran not playing well. Like I said, White is sick. Boudreau says he’s questionable for tonight, but I can’t imagine he’d play when the Wild has spent all month keeping sick players out of the locker room. So with Tyler Graovac in Iowa, Pominville and Jordan Schroeder should play. No line combinations in today’s skate, but I truly feel it’s time Boudreau settles on a top-9 and lets em ride to regain some consistency and chemistry in the lineup. The entire month has been chaos in the lineup, and this goes all the way back to early February when Boudreau began experimenting with the lineup nightly to see what best the team needed heading into the trade deadline. I’d go with Parise-Staal-Coyle; Zucker-Koivu-Granlund; Niederreiter-Haula-Pominville (the great line of last year’s second half); Stewart-Hanzal-Schroeder, and maybe flip Haula and Hanzal depending on matchups. I know that’s easier said than done considering the loot the Wild gave up to get Hanzal and White, but it’s time to calm down this hectic lineup and just settle on something. That’s my opinion. I could be wrong. Kevin Falness and I are co-hosting for Paul Allen from 9-noon on KFAN tomorrow, so please tune in. Doug MacLean and Pierre LeBrun are two of our guests, and there will be plenty more surprises. Also, the next Russo-Souhan Show is tomorrow night at 6 at Hell’s Kitchen. Please join us and make a reservation near the stage.